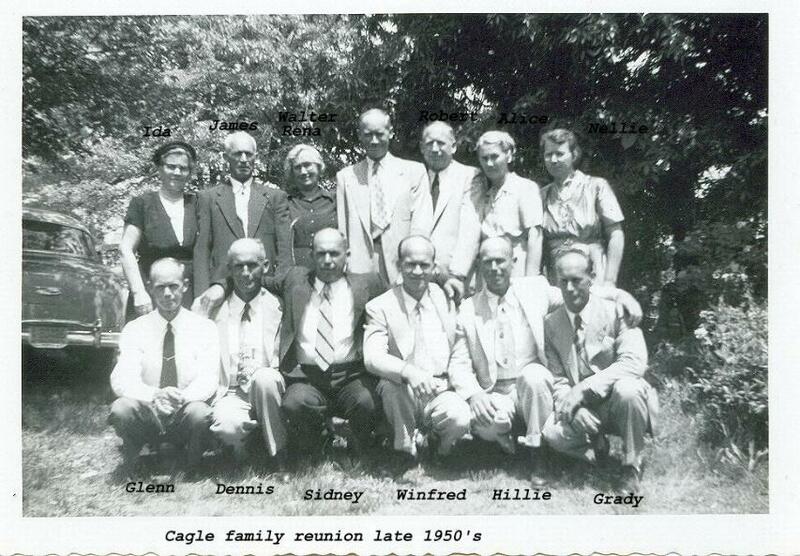 Comments: Dennis G Cagle (Nee: ) | Ga USA | 1941-1960 | Comments: This photo was taken at the Cagle family reunion in the late 1950s. It was the last time all the children of the late Henry Lee Cagle jr. and Annie Clark Cagle would be together. Henry Lee Cagle jr. was born in Haywood N.C. in Nov. 4 1872 died in Pine Log, Ga. In Dec. 3, 1937 and Annie Clark Cagle was born Feb. 28, 1876 In Bryson City N.C. and died April 23. 1937 in Pine Log,Ga. Their children Standing Left to right were Ida H. Cagle born Feb. 2,1893 died March 3,1982 James G. Cagle born Aug 8,1894 died Aug 1,1959 Rena B. Cagle born Sept 2,1896 died May 24,197 Walter M. Cagle born Aug 26, 1898 died May 16, 1972 Robert E.Cagle born Feb. 22,1901 died Aug. 21,1961 Alice E. Cagle born Jun. 17 1903 died July 19 ,1986 Nellie A. Cagle born July 29, 1905 died March 30 ,1990 Front row left to right Glenn O. Cagle born Dec.12, 1907 died July 5,1974 Dennis G. Cagle born April 17, 1910 died March 6, 1988 Sidney F. Cagle born July 11 ,1912 died July 7, 1985 Winfred N. Cagle born Jan . 15 ,1915 died March 18, 1993 Hillie L. Cagle born June 6,1917 died March 28 , 1991 Grady W. Cagle born Oct. 23, 1919 died Oct. 4, 1985 The Cagle Family was from Bryson City N.C. in the late 1930s the United States decided to place their farm inside the Great Smokie Mt. Park. The goverment bought their farm and the Cagles moved to Pine Log Georgia , buying a farm from Isacc Lincoln Garland.